The weekend of collaborative meetings will take place at the U.S. Olympic Training Center in Colorado Springs. COLORADO SPRINGS, Colo. — USA Triathlon today announced that the 2018 USA Triathlon Race Director Summit, presented by ACTIVE Network, will be held Feb. 23-25 at the U.S. Olympic Training Center in Colorado Springs and feature a new collaborative format. 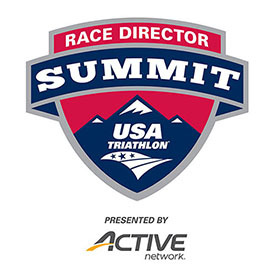 The Summit, formerly the USA Triathlon Race Director Symposium, is an opportunity for race directors to share ideas and best practices while gaining continuing education units (CEUs) to advance their professional development. As part of the three-day event, attendees have the opportunity to stay at the U.S. Olympic Training Center in Colorado Springs and experience the lifestyle of Olympic and Paralympic athletes firsthand. This all-inclusive option includes housing at the OTC dormitories, meals at the on-campus dining hall and transportation to and from the Colorado Springs Airport. Those interested in staying offsite will be eligible for a group rate at the Antlers Hotel in downtown Colorado Springs. Transportation will be provided between the Antlers Hotel and the Olympic Training Center on Saturday and Sunday. In addition to general sessions, a new format will feature small-group discussions led and facilitated by the race directors themselves. USA Triathlon also reduced the cost of attending the conference to $150, enabling a wider scope of race directors to participate. Driven by the USA Triathlon Race Director Committee, the new format is in response to feedback from the event organizer community. Breakout sessions will cover topics such as: growing participation for women and youth in multisport; optimizing grassroots marketing and social media to grow your race; effective pricing, promotion, referral and discounting strategies for increasing attendance; creating a trusted circle and choosing your core staff; appealing to both traditional older and millennial triathletes; and the top resources race directors would like to see from USA Triathlon. For more information about the 2018 USA Triathlon Race Director Summit and to view a tentative schedule, visit usatriathlon.org. Registration is now open at Active.com.